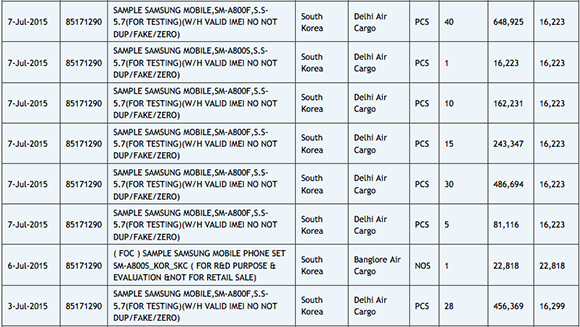 Samsung has commenced testing phase of the Galaxy A8 smartphone as indicated by the import listing on India site Zauba. The Galaxy A8 has not exactly been one of the best kept secrets - it has been spotted in live images, video, and even certifications. The Galaxy A8 joins the A-series with 5.7” 1080p AMOLED display, Snapdragon 615 SoC, 2GB of RAM, 16GB of expandable storage, 16MP f/1.9 primary camera, 5MP front snapper, and Home button with a fingerprint reader. Samsung is tipped to introduce the Galaxy A8 for €439 ($494) with the official launch to happen in China on July 17.